New York City will receive $176 million in federal funding for disaster recovery. The funding would be put towards a section of the project extending from the northern portion of Battery Park City to Montgomery Street on the Lower East Side. The money is part of $181 million in funding for recovery projects in New York and New Jersey. The funds came from the National Disaster Resilience Competition, a U.S. Department Housing and Urban Development–sponsored competition to rebuild communities affected by natural disasters, The New York Times reports. The BIG–designed East Side Coastal Resiliency Project (scaled down, but known in former incarnations as the DryLine or the BIG U) calls for sea walls, retractable flood barriers, and grass berms that would double as riverside recreation areas, opening up the waterfront to create a shoreline comparable to the recreation-rich shores of Manhattan’s West Side. The East Side Coastal Resiliency Project arose from Rebuild by Design, a 2014 competition to solicit ideas for six large-scale flood protection and resiliency measures in the tristate area. Rebuild by Design awarded New York City $335 million in federal funds for the East 23rd Street to Montgomery Street section. 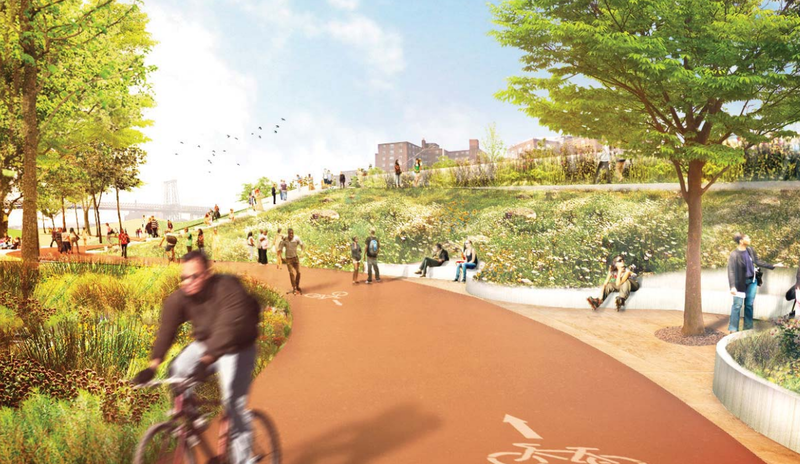 Mayor de Blasio has committed $100 million in capital funding to the project already.